Sandia Office Supply carries a full line of office calendars and planners to assist with your organizational needs. Whether you need a daily planner or a monthly desk calendar, you can count on us to have the products you need to keep your schedule organized. 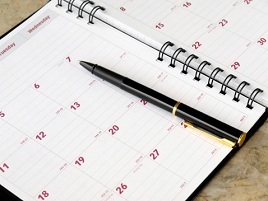 Ordering the office calendars and supplies you need is as easy as clicking a button. Just select the item(s) you want from our convenient online catalog and viola—your order will be shipped right away! Once you’ve placed your order, it will arrive with free, next-day delivery. Our next-day delivery is included with every order you place, with no minimum order required. If you can’t find the office accessories you’re looking for or need assistance selecting the best product for your needs, our local account representatives are standing by to help. We’ll work with you to get the supplies you need and also discuss ways to maximize your budget with cost-saving alternatives and options. When it comes to keeping your business stocked with the office accessories you need, you can count on us to have the assortment of supplies you need to maximize your efficiency. In addition to office calendars and day planners, we carry over 30,000 office supply items available for FREE next-day delivery. With Sandia Office Supply, you can always count on us to be there with the fast, friendly, reliable service you deserve. Contact us to set up your account today! Call 505-341-4900 for discount office supplies in New Mexico!